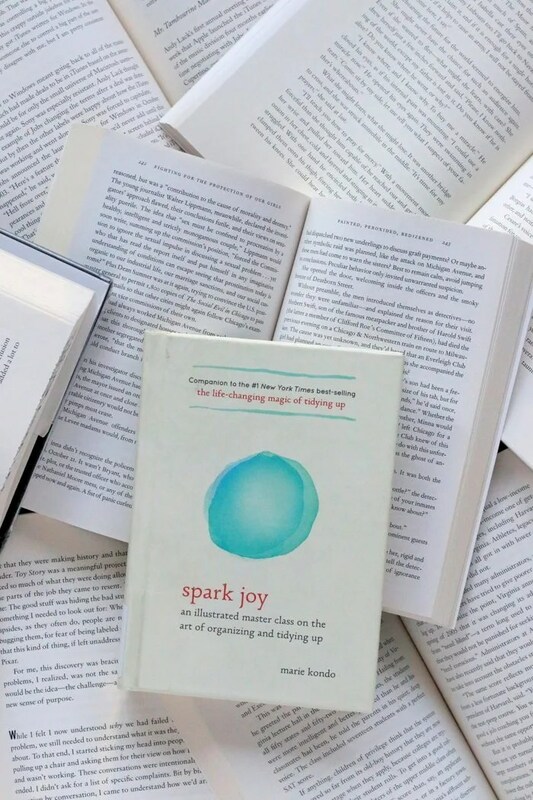 A while back, I read The Life Changing Magic of Tidying Up by Marie Kondo. I enjoyed the book and took away a few key lessons, though I didn’t go full throttle and employ every step of her method. Not surprisingly, I still have more junk in my little city apartment than I’d like, but we do have some clear cabinets and shelves. That’s a win, right? When her sequel, Spark Joy, was announced, I placed a hold on that bad boy before it even hit the market. I got my copy from my library not long after the book was released. Although I didn’t fully embrace all her steps (which she clearly states will cause the method to fail #dontcare), there’s one step I’ve embraced 100% and absolutely love. Simply, Kondo recommends storing things vertically. Instead of leaving stacks of paper on counters, books piled up on shelves, and clothes layered on top of each other in drawers, turn everything upright. You guys… this tip is genius. You have to try it! I bought two magazine holders for my counter. Kondo wouldn’t love that I still have a collection of papers on my counter that need to be filed or trashed. But she would appreciate that I’ve created a dedicated, vertical storage system for them so they don’t splay all over my kitchen counter. 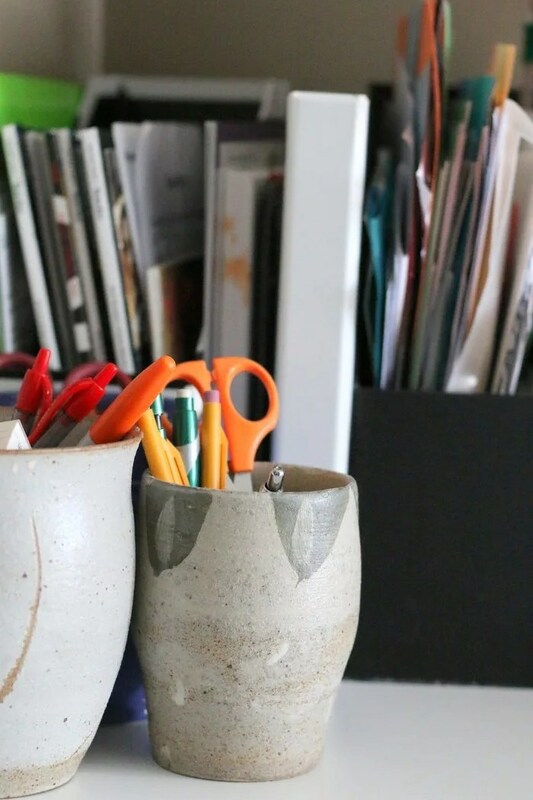 Pens and pencils reside in two clay pots I’m pretty sure my sister made in high school pottery class about a decade ago. In about five seconds, I turned my stack of wallets and clutches in my closet 90 degrees. Wallah! So. Much. Better. It sounds too good to be true. But the gratification was immediate. Next (a few months later, admittedly), I headed to my dresser drawers. I folded my cotton shirts one extra time and now they stand up beautifully. Instead of folding my yoga pants in half and then in half again, I folded them in half and then in thirds. Now they stand perfectly. I also did the same with my boys’ little clothes and realized just how much clothing they have. I’ve apparently not been so successful at keeping their wardrobes to a minimum. It’s totally crazy how seeing all the items at once makes me enjoy them more, use them more efficiently, and realize just how many I have! If you haven’t read the book, I highly recommend it. I borrowed the first book on audio from my library and the second in paper, also from my library. They’re fairly quick reads and you’re sure to take a thing or two away from them. Many feel their lives have been transformed by the book and have joined Facebook groups to share their excitement and enlightenment. Whether you’re ready to clean up a bit or clean out a ton, Kondo is the real deal. You may not love every single suggestion in the book. She’s very rigid in her rules and carries a confident attitude in the book that borders on annoying (at least in my opinion). But she stands behind her stances with vigor and proof, and I’m inclined to mostly follow her methods despite (or maybe because of) the rigidity of her claims. If you’re still pursuing your New Year’s Resolution to declutter, pondering a more minimalist life, or just sick of all your crap laying around everywhere, this is a perfect place to start! Have you read either of her books or tried her methods? What do you think? That’s interesting about the vertical storage. 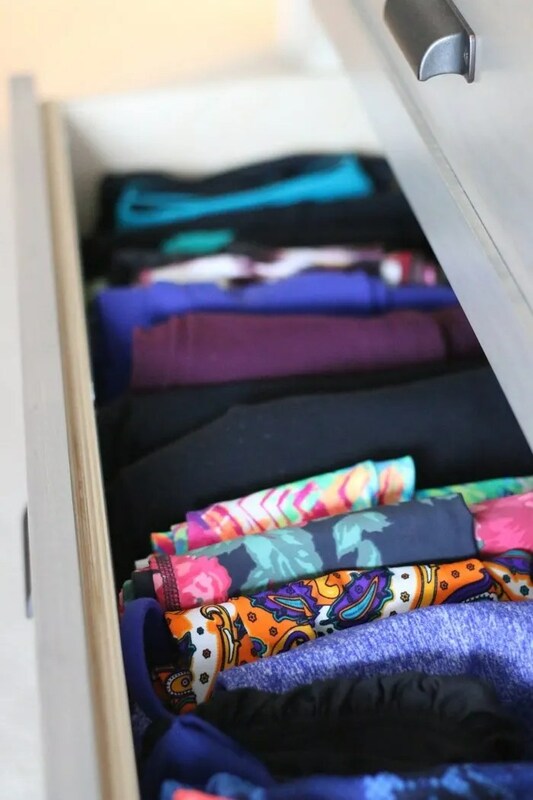 I’ve always done that in my tshirt drawers so that I can see them all and I have my pot lids vertically, but I’m going to have to try it with other things, especially at the office. I’m not much of a piles person at all. Purging feels so good! Couldn’t agree more. It’s so liberating. 🙂 Thanks for the note!